By A.W. M'Callum, Harper's Weekly, June 22, 1867. 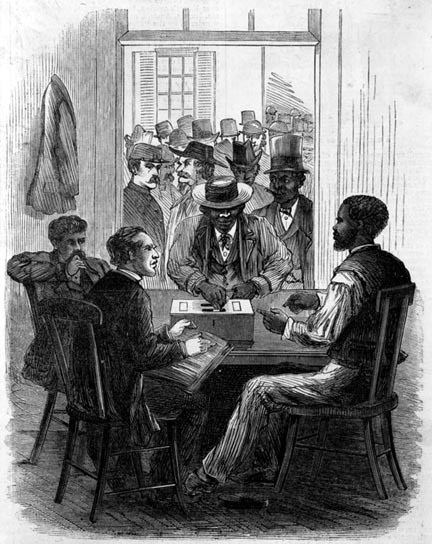 Alexandria's 1865 tax assessments are the first to record, in substantial numbers, the names of the many African Americans who were, until less than three years earlier, still slaves. The names herein recorded are, of course, heads of households and adult males; the researcher looks in vain for most women and any children. Those with no information after their names were simply charged the "head tax" and owned no taxable real or personal property in town. Unlike most of Alexandria's tax assessments of the era, those of 1865 were arranged roughly alphabetically, by first name of surname (here, they have been placed in complete alphabetical order). Other years' assessments were taken in order as found along the tax collectors' canvassing routes, better pinpointing locations. For many of the real estate entries here, however, a street name is recorded. This, of course, narrows down the address, but only within the confines of the town ward. These entries are interesting, both in their valuations and descriptions. A "house & lot" indicates ownership of just that. A "house" alone, suggests the ownership of only a dwelling upon a lot occupied either by virtue of paying a ground rent to the lot's owner or by simply squatting. Descriptions in various contemporary sources suggest that, in the overcrowded war-era town, African American shantytowns sprang up on both abandoned property and rented lots. Valuations of as little as $25 or $50 do suggest the frequent appearance of veritable shanties, in a town where the smallest brick houses on lots would be valued at about $300. 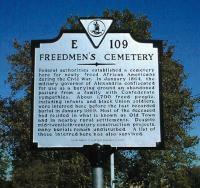 Transcribed by Timothy Dennée for the Friends of Freedmen's Cemetery, 2001, all rights reserved.